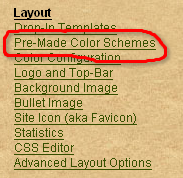 The Pre-made color schemes are the simplest method of quickly changing your color scheme in the default layout. 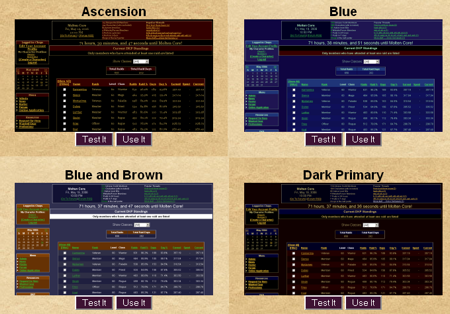 This method is a quick way to assign colors to the Color Configurator. These simple templates will get you a quick and dirty color scheme, but without the glam of the Drop-In Templates. They are also the most flexible layout available for the non-techophiles who wish to get their site working and running simply. On that page, under "Layout" you'll find an option "Pre-made color schemes"
This will bring up a series of preview images with "Test It" and "Use It" buttons below each. Clicking "Test It" will reload the current page with a the selected color schemes, but as soon as you click another page, it'll deactivate. Clicking "Use It" will change your current site to use that color scheme. After this is done, you may wish to further customize the colors of this. You can do this one of two ways. The first, and easiest is with the Color Configurator.